The trees are up in the kids bedrooms and they are ornament obsessed! They decorate their bedrooms trees with homemade ornaments each year and have been asking to make more ornaments since we made our angel ornaments last week. 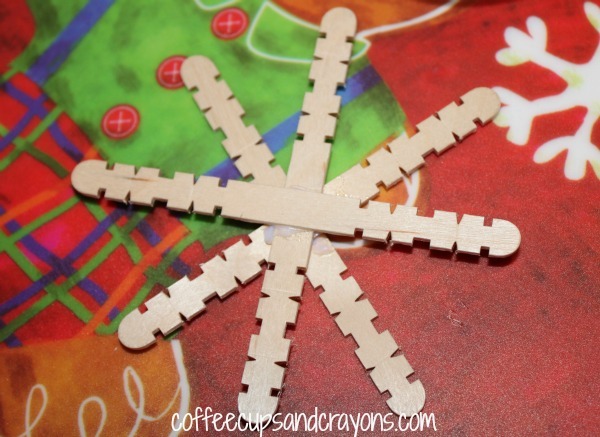 So yesterday we made popsicle stick snowflake ornaments! 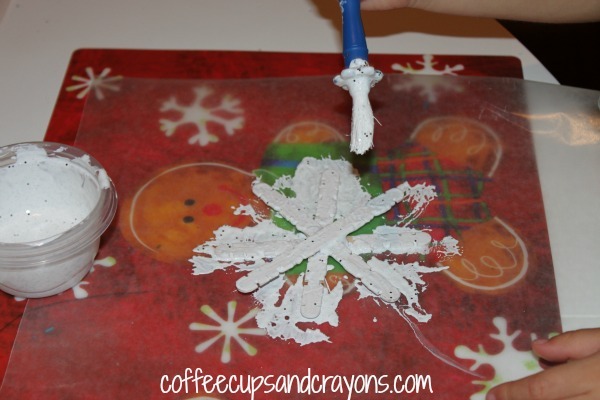 We started by gluing three craft sticks on top of each other (above) to form the snowflake shape. We used these funky shaped ones we had leftover from making mini bow and arrows. Then they painted the sticks with a paint brush. They wanted to add glitter to the paint to see if it would make it sparkly. It worked a little bit with the purple and blue paint, but was a total bust in the white. 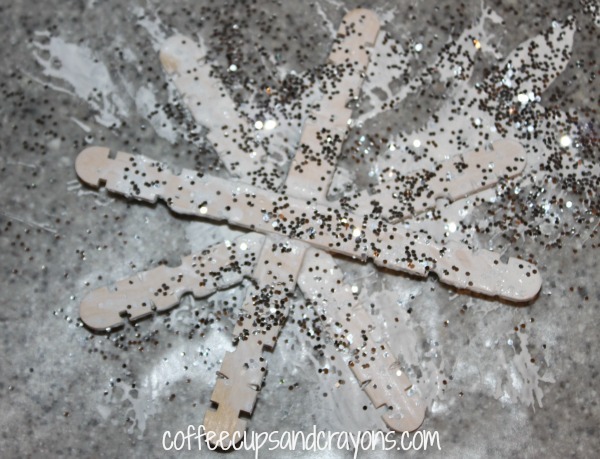 So, after they painted the snowflakes we added lots of silver glitter! 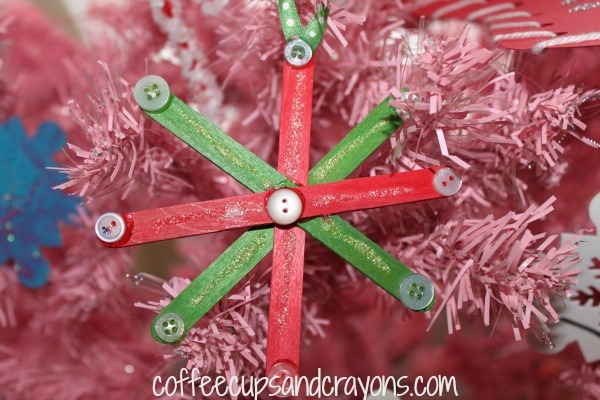 Once they were dry I hot glued twine to the top and they hung them on their trees! They look so pretty sparkling on the trees! My oldest kept going and made some from colored popsicle sticks, buttons, and ribbons! 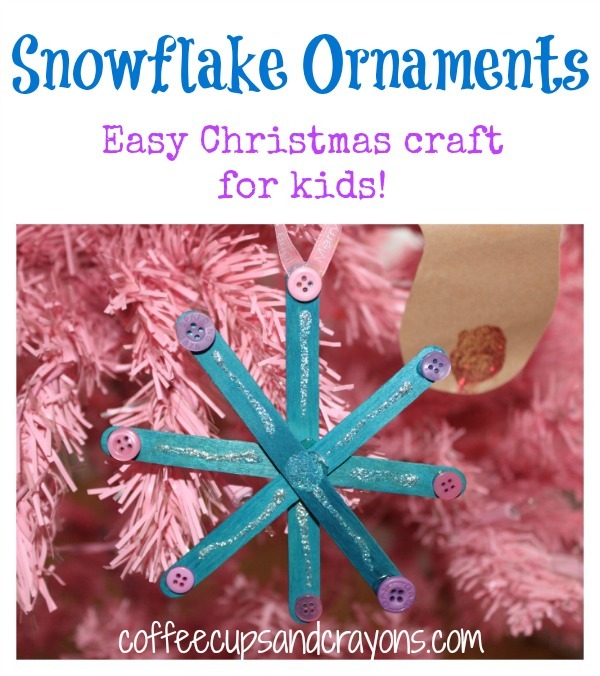 Do your kids like to make ornaments? 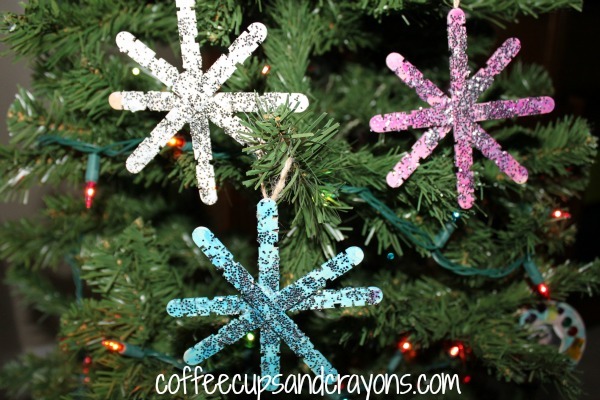 What will you decorate your snowflake ornaments with? Darling! We will need to try these. Thanks Kristina! My 4 and 6 year old are making more even as we speak…although that batch will be given away! One of our traditions is making ornaments not only for our tree but for our close family members as well. We have made some really cool ones over the years. Makes it so much more meaningful! Although at the rate we are going times 3 I am wondering if the grandparents are going to need multiple trees too! 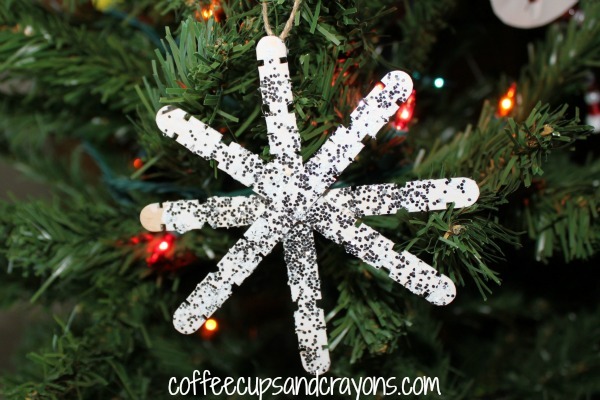 I love these – especially the craft sticks with notches in them. They make great snowflakes! I think homemade ornaments are the best! I especially love the snowflake with buttons! What an easy to do ornament. This is being Pinned for sure. Thank you for sharing and for linking up to the Empowered Living hop. Hope to see you back again. Love it! Found you through Kids Co-Op! Thanks! I’m so glad you stopped by! Awww thanks! I love how they look on the tree! Thanks for stopping by! These are so cute! I’ll definitely remember this idea for next year. Cute and easy–perfect for the rush before Christmas! Thanks for stopping by! I work in a nursing home and I made these with some of my residents. I hot glued the sticks together and let them dry. I let the residents “paint” on the glue with a foam brush and sprinkle on the glitter. I love it! It really is perfect for all ages!